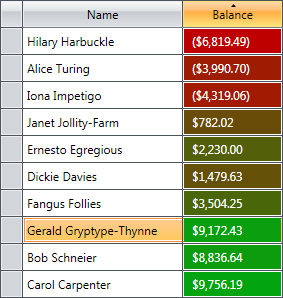 The Mindscape WPF Data Grid allows users to edit a collection of data in a tabular, spreadsheet-like format. New in WPF Elements 5.0! View, compare and edit multiple data items in a compact, spreadsheet-like format, presented according to your exact specifications and extensible to your particular domain. 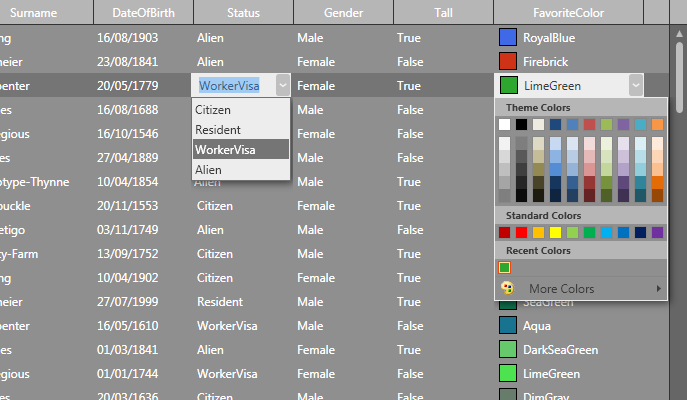 Easy to implement and incredibly customizable, the WPF Data Grid provides out-of-the-box support for paging, frozen columns, sorting, validation and much more, plus five gorgeous themes to make it fit elegantly with Office-style applications. Extensive support for custom editors makes it easy for you to tailor the editing experience to the kinds of data your business uses and the way your users think about that data. And thanks to its highly tuned virtualization core, the Data Grid remains lightning quick even with truly massive data sets. The Data Grid was built from the ground up following the WPF design paradigm, so all standard binding features are available. Populating the control is as easy as setting the ItemsSource property to bind to your data model. Underpinning the Data Grid is a virtualization engine which keeps memory footprint low and application speeds high. Even if you're binding to a large data set, the Data Grid will only create UI visuals for what is necessary. With more than a million records we've clocked the data grid at loading the data in under 400ms! And once the data is loaded, scrolling through those millions of records remains an incredibly responsive experience. Lots of data to show? No need to overwhelm your users -- the Data Grid can break it up into conveniently sized pages. Users can easily navigate through data using the built-in paging control, and the control provides many appearance and behavior options, including placement of ellipsis, number of page buttons displayed and page size. 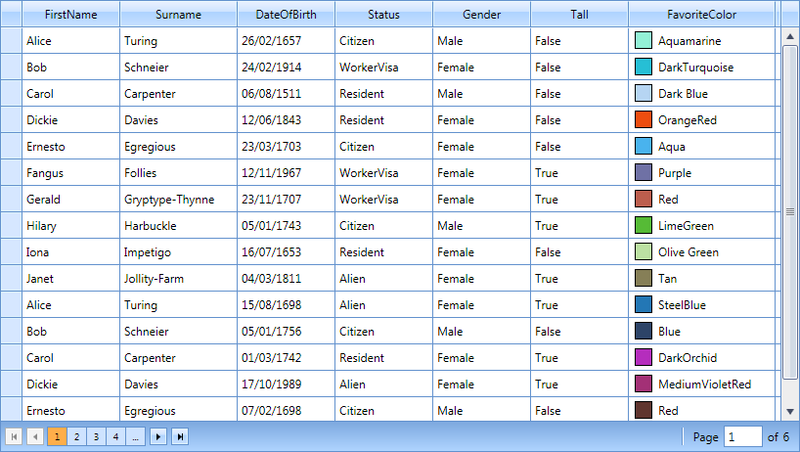 Records can be sorted by clicking on the column header, a specified number of columns can be frozen on screen while the horizontal scroll bar pans the remaining columns - they can also be reordered using drag-and-drop behavior. Give your users as much flexibility as you want, or lock down the user interface to its core.